This map helps to illustrate some of the Pre – Revolutionary War original Bucklin land ownerships relative to Providence. 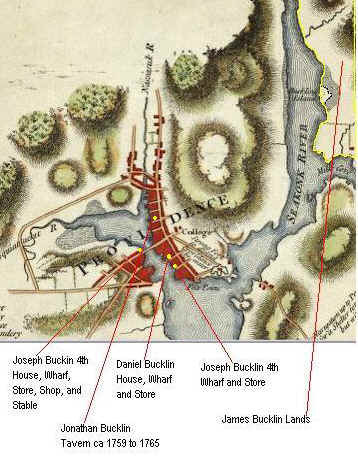 Note the locations of Bucklins having property in Providence before the American Revolution. Bucklin’s Island, which shows on the map (in upper right corner area) is really a point of land with a marshy area in the broad neck of it, which marshy area would be underwater at high tide. The map makers choice indicating Bucklin Brook, instead of other streams, is interesting. it may have been because the Seekonk River is a tidal river, and Bucklin Brook is the first source for easily drawn fresh water. North of Bucklin Brook was Bucklin’s Landing, used as a place to unload ships having goods for the Rehoboth area, the last place northward where there was easy access off the river bank, but the depth of the river was great enough for ships. (Capt Daniel of Providence had his home at this landing originally.) If you took a boat from Providence, this was the place of usual landing to get to Rehoboth. North of the James Bucklin II landholdings the east bank of the Seekonk all the way to the falls (and fording area above the falls) and the Pawtucket (Rehoboth) bridge was Bucklin land. In short, whatever way you went between Providence and Rehoboth before the Revolution, you had to notice the relative importance of the Bucklin land holdings. likewise, if you traveled by stage to Boston, you had to cross the bridge at Pawtucket, right at the Bucklin mill operation and travel through Bucklin lands thereafter. These Bucklin land holdings had existed from 1645, so they were known by generations of persons in Providence. Read more on the Bucklin Rehoboth land holdings. It was approximately 6.5 miles from the house of James Bucklin 2d, in Rehoboth, to the house of his cousin, Joseph Bucklin 4th in Providence. The James Bucklin 2nd lands extended northward to other Bucklin’s lands on the east bank of the Seekonk River. The area on the south end of the James Bucklin holdings was a 200 acre plot that James used as part of his (apparent) plan to control all of the areas suitable for mills on the east side of the Seekonk. The Bucklin land holdings of 800 acres exceeded in size the compact part of the town of Providence. Read more about the Bucklin land ownership and also about how the families of Joseph Bucklin 3rd and his brother James Bucklin 2nd understood, before the Revolutionary War, of the value of turning from agriculture to mills or merchant occupations as a source of family income.